Engine 222 AOS and reported heavy smoke showing and went in-service with a 1-3/4" waterline. 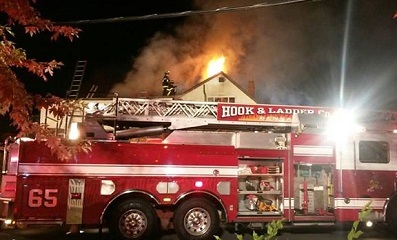 Chief 65 arrived shortly thereafter and established Nottingham Command and ordered Engine 65 to assist Engine 222's crew, Engine 88 to stretch a second hand line to the courtyard and Ladder 8 and Ladder 1 to vent the roof. Interior crews reported all searches were negative and that they had heavy fire running the void and attic spaces, additional hand lines were stretched. 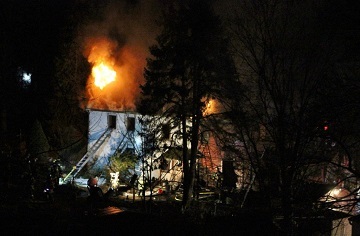 Roof operations opened three ventilations holes and reported extension into the "C" exposures. 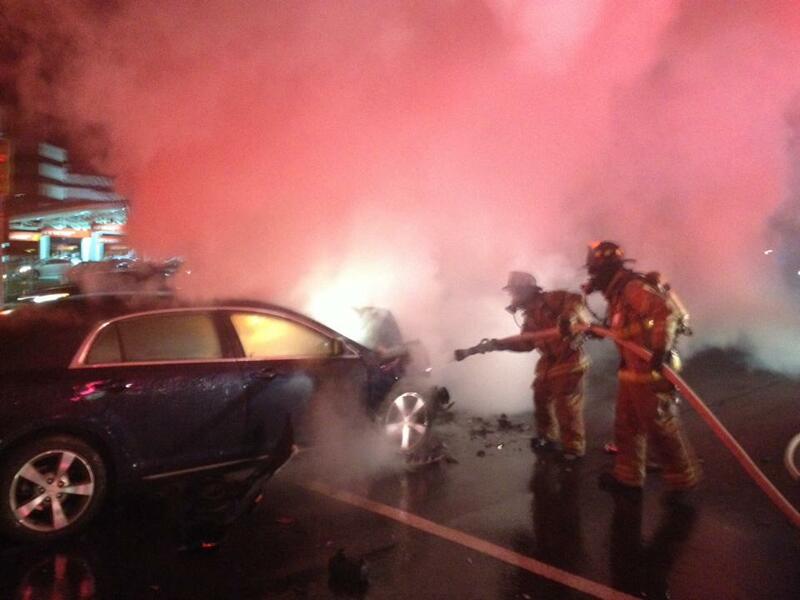 Engine 44, Engine 84, Rescue 8 and Rescue 9 were also on scene and in-service. The fire is under investigation by Bensalem Township Fire Rescue; approximately 13 out of the buildings 16 apartments suffered fire, smoke and/or water damage. BC222 AOS and reported smoke showing from a one story single family dwelling and set up Nottingham Command. Engine 222 established a water supply and went in-service with a 1-3/4" waterline along with Special Service 222. 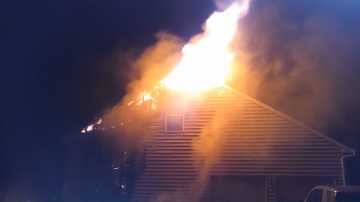 Engine 65 arrived and conducted a search and ventilated the dwelling. Ladder 1 and Rescue 8 assisted with overhaul operations. 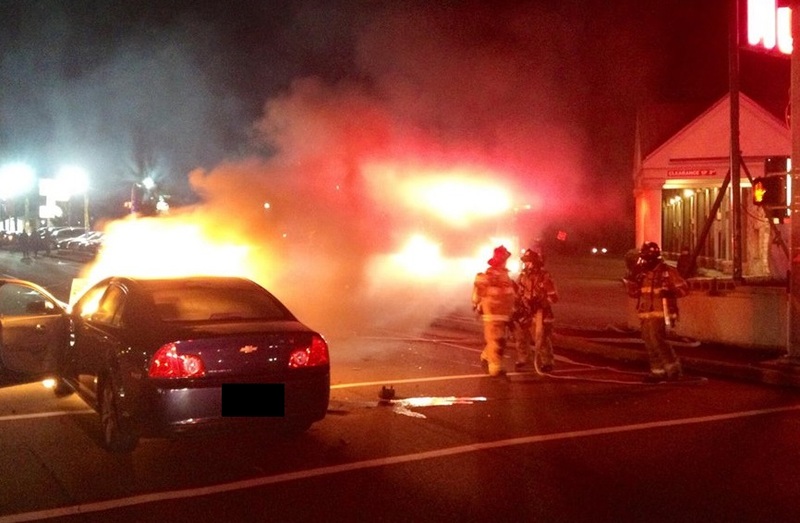 Bensalem Township Fire Rescue and Bensalem Police are investigating the cause of the fire. Engine 65, Engine 222, Engine 84, Bensalem EMS and Bensalem PD responded to an MCI on the PA Turnpike just prior to the Bensalem Interchange. 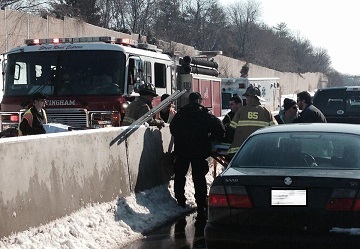 Crews assisted medic units with patient care and securing hazards. The highway was closed for approximately 7 hours and about 30 people were transported to area hospitals. Ladder 8 arrived on scene reporting heavy fire showing from a 2 story single family dwelling. All hands were placed in service. C9 AOS reporting heavy fire showing, with possible entrapment. 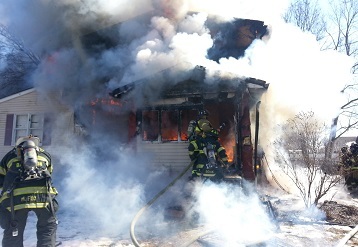 Crews made an interior attack and 2 victims were removed from the dwelling. All hands were in service for several hours. Both victims pulled from the residence were pronounced dead at St. Mary medical center. The officers and members of the Nottingham Fire Department wish to express our condolences to Assistant Chief John Izak and his family , his father Zenovy (George) Izak passed away on March 20th at the age of 80. Thoughts and prayers of the entire NFD family are with the Izak family during this time. It is with deep regret the officers and members of the Nottingham Fire Department announce the death of Nottingham Life Member Marie Harris, who passed away on Friday April 4, 2014. Mrs Harris was the wife of past Chief and Life Member Joseph Harris and the mother of Chief Ron Harris and past Chief Don Harris. Thoughts and prayers of the entire NFD family are with the Harris family during this time. E222 AOS with smoke showing from a 2 story single family dwelling. 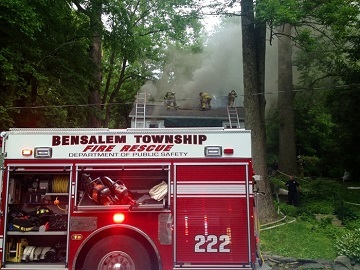 BC222 established Bensalem command , E222, R4 & E88 placed 2 lines in service and conducted searches, L65 opened up the roof and vented the dwelling. The cause of the fire is under investigation by Bensalem Township Fire Rescue. The officers and members of the Nottingham Fire Department wish to congratulate firefighter Tim Schwartzer and the rest of the graduating seniors in the class of 2014. Chief 65 AOS with heavy fire showing from a 2 story single family dwelling. Crews from E65,E84, R4, R8 & L65 were all placed into service. One firefighter was treated at the scene with minor burns. The cause of the fire is under investigation by Bensalem Township Fire Rescue. 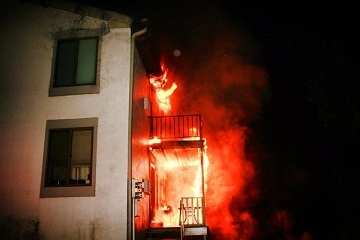 Chief 44 AOS with fire showing from a 2 story apartment building. L65's crew opened up the roof as Interior crews made a quick knock on the fire. The cause of the fire is under investigation by Bensalem Township Fire Rescue. The officers and members of the Nottingham Fire Department wish to offer congratulations to the new Mr. & Mrs.Caywood Osthaus who were married on Saturday September 20th. Best wishes from all of us for a long, happy and healthy life together. 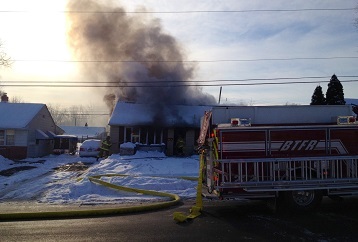 Deputy 28 AOS with heavy fire showing from the rear of the Bucks County Dance Studio. E88 & E28-1 placed two handlines in service while L65 opened up. The Bensalem FMO has determine the fire to be arson, and continues the investigation. 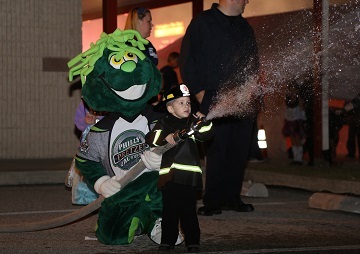 Thank You to all of our friends, families and members of our local community that came out this year as we began a new open house traditon , with a halloween themed costume party. Also thank you to all of local businesses and organizations that made donations or spent the evening with us. All money raised from the sale of food, lemonade and raffle tickets will be donated to the Alex's lemonade stand charity in the name of the Nottingham Fire Department. Thank you for your support. The members of the Nottingham Fire Department celebrated our annual Christmas party on Saturday December 13th. 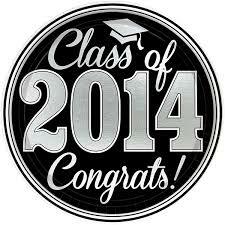 Congratulations to the recipients of this years awards. Captain Kevin Costello was named 2014 Firefighter of the Year. The Chiefs Award(s) for 2014 were given to both Firefighter John Ehlmann and Firefighter Dan Hinkle. Company Treasurer James Esposito was presented with an award for 40 years of consecutive service and President FF Dave Hunter was presented with an award for 25 consecutive years of service.